One of my favorite restaurants in Bend is a Lebanese restaurant called Kebaba, and I always have to order their carrot and feta jam…. its so deliciously sweet and savory. Somehow we ended up with four bags of carrots in our refrigerator, so I figured trying to recreate this deliciousness was a good way to put a dent in our carrot stash. 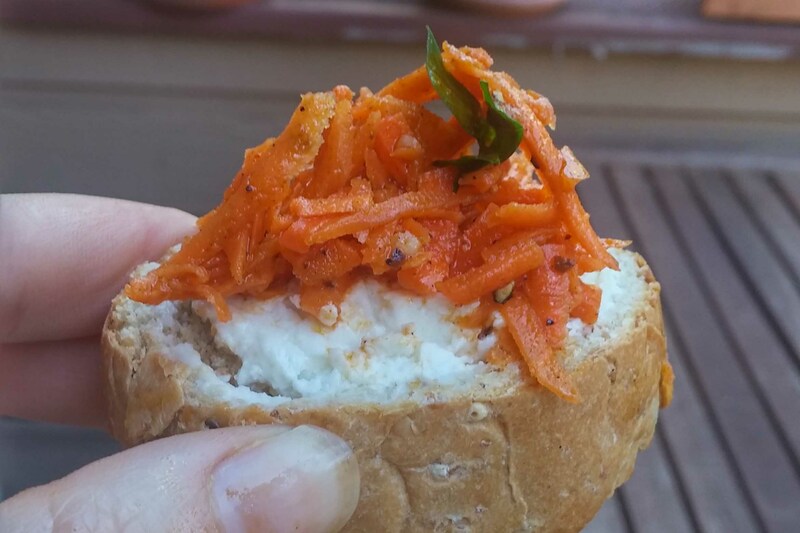 I however did not make carrot jam, but chose to make some pickled spiced carrots instead and used goat cheese instead of feta… and french bread instead of pita, so it really wasn’t the same at all, but it was equally as delicious. 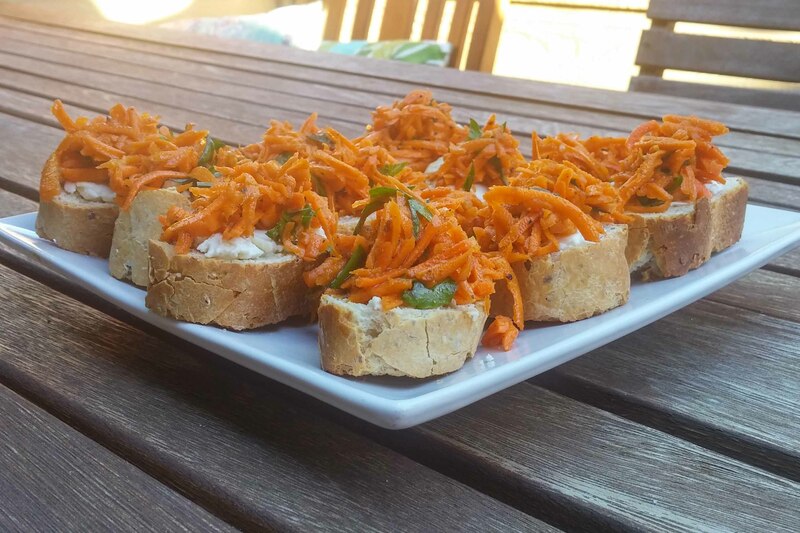 I came across a recipe on EdibleFeast.com that looked just about right, modded it out and here is my EdibleFeast/Kebaba inspired Moroccan Spiced Carrot Bruschetta. Combine shredded carrots (I used my food processor because I’m lazy…even too lazy to use my mandoline) with olive oil, apple cider vinegar, white wine, honey, parsley, garlic, fresh ginger, ras-el-hanout, cayenne, and salt and pepper. Mix it up, cover it and put it in the fridge for a couple of hours. Preheat your broiler. Slice your french bread into 1/2 inch slices and then toast under the broiler until just golden. While the bread is still warm spread the goat cheese on. To serve top your toasts with the carrots and you’re all set. You likely have all the spices in your pantry, you do not need to go out and buy the blend, just make it yourself. This recipe is from Epicurious… I only made a couple of changes as noted below. This is a flavor combo that I’ve seen show up in other moroccan dishes that I’ve made, so I’m pretty sure my remaining spice blend will be used up quickly. Combine all ingredients, stir them up and store in an airtight jar. Should keep for a month or so according to Epicurious.